What is Harvie? 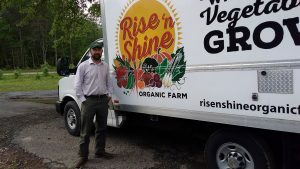 It’s an online platform that connects local consumers to local farmers through a customer-friendly CSA / farm share model, including customized shares, payment plans, a Cooking Suggestion Engine and more! We want you to love your farm so your farmer can build a thriving business that takes care of the farm family, their employees, and their land. It’s been a long journey for me to get to this point: the story of why I created Harvie started almost 13 years ago. 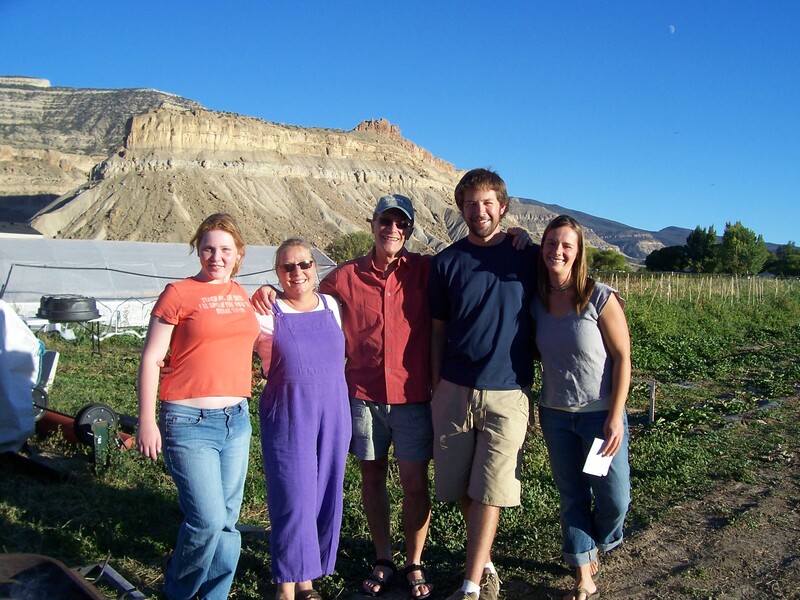 In 2005, I helped a fruit farmer in western Colorado start a CSA / farm share program. Thomas, the farm owner, was inspired at the Tierra Madre conference in Italy to start a farm share. With some good local connections, we got a story in the newspaper and the local TV station came out to do a segment. In a few weeks, we had over 100 families in the area signed up and we were up and running! At Rancho Durazno with CSA members. The community was hungry for fresh, local, and tasty fruits and vegetables. The appeal is obvious: get just-picked fruits and vegetables directly from a local farmer who you know and trust. There is no better way to eat seasonally and ensure that your kitchen is always stocked with high-quality delicious food. For me, as an aspiring farmer, the appeal was obvious too. I grew up on a small farm in southwestern Pennsylvania and all the farmers I knew had off-farm jobs as coal miners or teachers. It was clear to me as I learned more about sustainable agriculture that it is not a part-time job. To really steward the land and grow a thriving farm business takes 100% commitment which is difficult while juggling off-farm employment. In farm share, I saw a path for farmers to be full-time farmers. 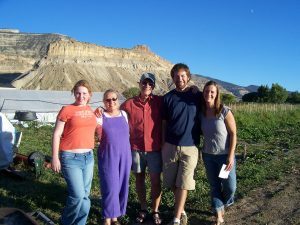 In 2006, after two seasons spent on the farm in western Colorado, I started my company, Small Farm Central, based in Pittsburgh, Pennsylvania joining my passion for developing technology products with my passion and experience in agriculture. In the intervening 12 years, we have served 1000s of farmers with our technology products that help farms directly connect with their customers. In those years, farm share programs grew dramatically across the US and Canada. In 2015, there were an estimated 5,000-7,000 CSA farms in the United States alone. This model was becoming an integral part of keeping small and medium-scale farms in business. From a set of early ad images I had done for Small Farm Central, our websites-for-farms business that was the first product I released. Everything looked rosy through 2012 and 2013. Farms were able to grow their membership and replace the members they lost. However, around that time I started to hear rumblings of trouble from certain farms that never had trouble filling their membership and growing each year — they were losing members year-over-year. We released a report based on farms using our software that showed the retention rates of farm share programs was 50%. Clearly there was a problem. Members were joining their local farm and then not sticking with it. Why were members leaving? In 2015, I started to take the problem seriously because I realized if I didn’t figure out a solution to the problems my farmers were facing, I was going to be out of business too! First off, the food buying landscape had really changed since I worked at Rancho Durazno in the mid 2000s. The consumer demand for local food had changed the marketplace. There were a lot more farmers markets than ever before. Whole Foods had stores around the country. Local grocery stores were touting their local produce. Meal kit delivery services like Blue Apron and Hello Fresh were big news. Smartphones and apps had become ubiquitous. Two day shipping from Amazon Prime was becoming the expectation. I spent time with the research papers on farm shares that came out of universities, I did large scale surveys with current and former farm share members, and had 1-on-1 long form interviews with members. I talk about my findings in-dept in “CSA: We Have a Path Forward”, if you are interested in more detail from the farmer perspective. I was trying to find solutions. My idea was that to help the farmers I work with, farm shares had to better fit into people’s lives. Almost all farm share programs use a standard share model where each member gets the same items in their box. However, none of us are “standard”. We all have likes and dislikes. If you don’t like beets (for example) and you get beets in your share, then you are either forcing yourself to eat the beets, giving them away to a friend, or throwing them away. All of these are bad experiences and I don’t blame you for leaving a farm share program because of this! 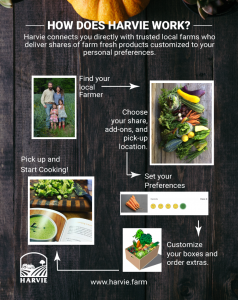 Shares from Harvie farms are customized based on your preferences and even allows you to swap items in and out of your box and purchase extras if you like! We have developed a system that makes this easy on the farmer, in the past this providing customized boxes was too logistically complicated to be viable. Many farm share programs require paying the seasonal balance of the share up-front because this gives the farm capital to buy seeds, start field work, and get through the months before harvest actually starts. However, this high up-front payment is difficult for many families to afford. Harvie allows you to purchase a share for 25% down and the rest of the cost is spread out over the season to keep the up-front commitment as low as possible. This a good compromise between giving the farmer some capital to start the season and member budgeting needs. Cooking should be fun and simple, but we live in this fast-paced world with long hours at work, hectic child activity schedules, and everyone is begging for more of our time. It is difficult to carve out the time to focus on cooking and if you buy a farm share, you will need to do a little cooking! Harvie’s Cooking Suggestion Engine provides storage tips, simple preparation techniques, and easy-to-cook recipes delivered by email based on the contents of your share each week so you can cook with confidence! The great news is with fresh, delicious ingredients that start with, it’s easy to be a good cook. Members expect to sign up online, pay with a credit card, get regular emails related to their share, maybe even use a mobile app to communicate their preferences with their farmer. 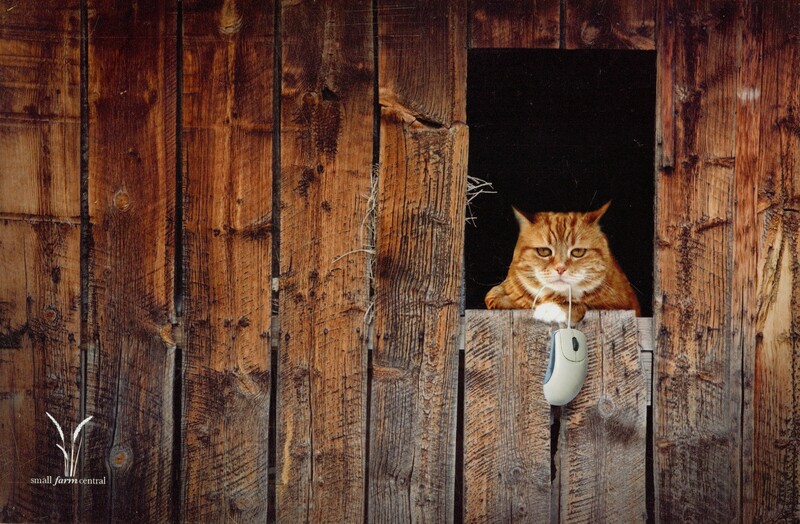 Harvie farms sign-up is online, accepts credit cards and more is coming in the future. For example, we’ll send you a text message when your share is delivered and a native mobile app for Android and iOS is coming this year. When members go on vacation or cannot pick up their share for any reason, in a classic farm share program the member simply misses out on that week. That is not a good member experience and many people leave or do not join because they cannot commit to be at the pickup site each week. Harvie allows members to move their delivery schedule around vacations or place shares on hold. Also more complex delivery schedules like every-other-week are available for members who travel more often or don’t need as much food. With these barriers in mind, my team and I started development of Harvie in late 2016. In the 2017 growing season, Harvie farmers delivered 7,000 shares. In 2018, we are growing quickly with over 100,000 deliveries scheduled and it is only May! Our farmers are selling out of shares early and increasing their retention rates. This keeps them in business so they can steward their land, take care of their employees, take care of their families, and keep growing food for you. Clearly, there is still a hunger for accessing fresh and local food and I believe that farm share is the best way to do that for both farmers and consumers. Harvie aims to make it easier to be in one of these programs, we want you to love your farm share. 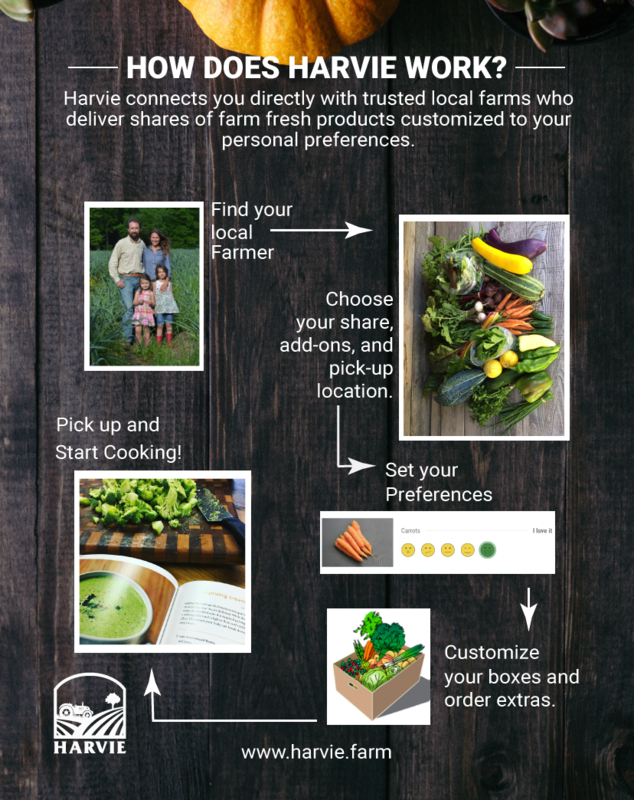 In addition, when you buy a share from a Harvie farmer you can be sure you are buying from a real local farmer (at least 75% of the share must be grown on the farm) and the farmer has the experience and infrastructure to deliver a quality share to you each delivery of the growing season. If you ever have any issues with your share, reach out to Harvie support or your farmer and we’ll make it right. Not only are you getting the highest quality local food in your kitchen each delivery, this is a purchase you can feel good about. The USDA just released their most recent “Farmer’s Share of Dollar” report which looks at the amount a farmer is paid for each $1 spent at a grocery store. It reached an all-time low this month of 7.8 cents of each dollar. With Harvie, 100% of your dollar goes directly to the farm. 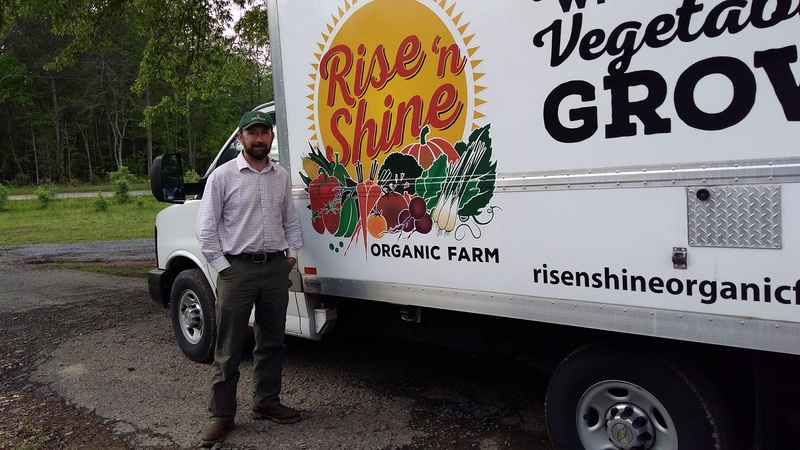 Mitch at Rise N Shine Farm in the Atlanta region was the first farmer to fully complete a Harvie delivery. Our mission at Harvie is two-fold: to bring you local food as conveniently as possible so you continue to buy from your local farm. Your purchases help us fulfill our second mission, to keep small and medium scale local farms in business. I always welcome your feedback on how we can improve. Please be in touch and tell me why you choose to support your local farm! P.S. You might be wondering why the service is named Harvie.. It is a play off the word “harvest”! Previous PostPrevious Introducing Our Harvie Farm Share + Member Starter Pack Giveaway!